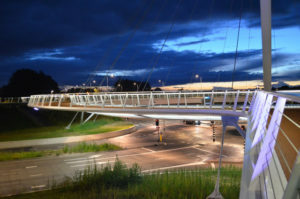 The northern approach from Eindhoven to Veldhoven consists of the Noordbrabantlaan in Eindhoven and the Heerbaan in Veldhoven. 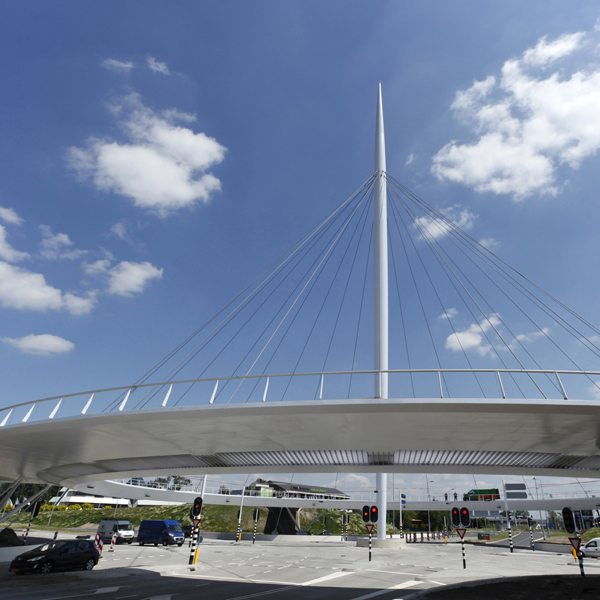 When the decision to build a new residential area in Eindhoven was made, engineers and planners came up with an innovative solution to cope with the increase in traffic at the pre-existing roundabout. 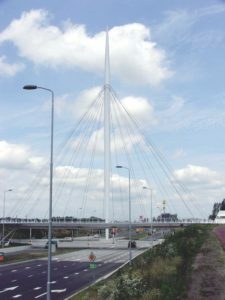 A regular intersection with traffic lights was constructed for car traffic, and an elevated roundabout, suspended from a 70-metre high cable-stayed bridge, was engineered for cyclists. 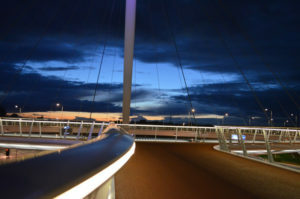 The name Hovenring was the result of a competition held among the population of Eindhoven and Veldhoven. One of the challenges in the design process was the spatial integration of the approach ramps because the available area for this project was limited by existing building and infrastructure. 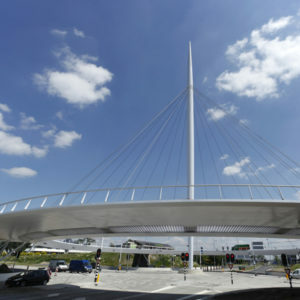 The Hovenring’s designers were set on making it pleasant to use and accessible: the only option that successfully allowed for comfortable slopes was to lower the ground level of the intersection underneath by a metre and a half. 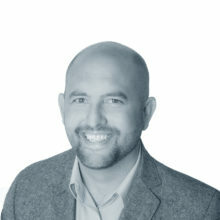 The design and construction process was also subject to a plethora of technical challenges. 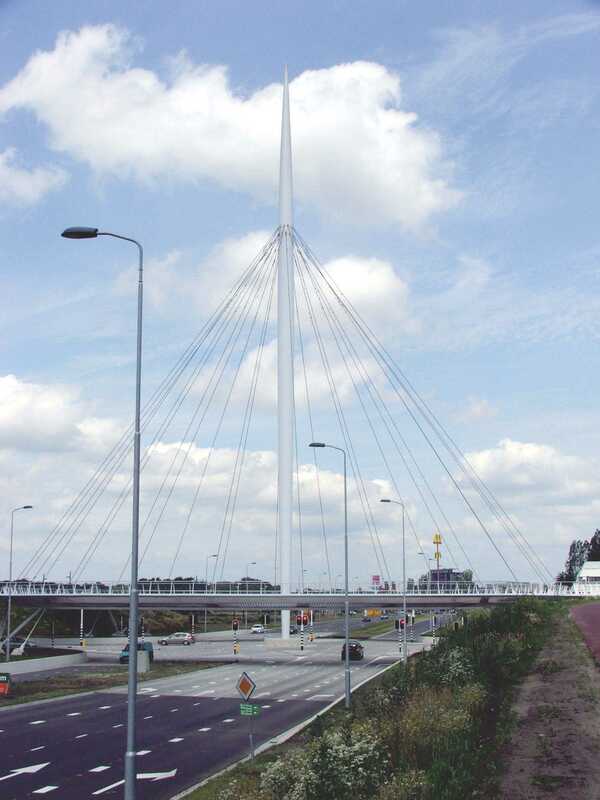 For example, there was the issue of wind-induced vibrations in the bridge’s cables. 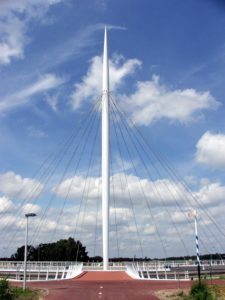 This issue has since been successfully resolved: with the replacement of the ropes and the installation of silencers, cyclists may now enjoy a safe and comfortable crossing. This so-called “floating doughnut” has a diameter of 72 metres and is fully constructed of steel. 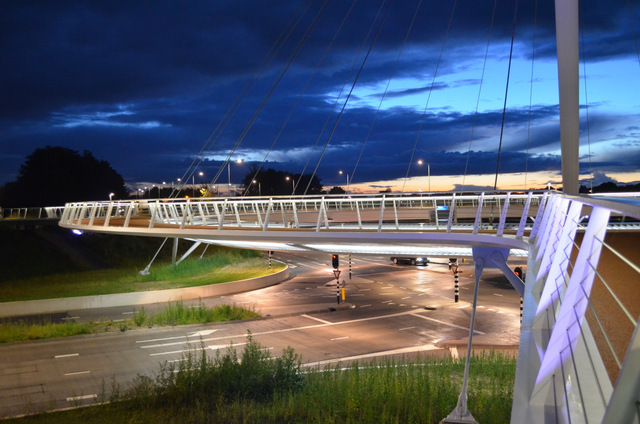 This bicycle crossing cost approximately 19 million euros and has been operational since 2012. In 2012, this fine example of cycling infrastructure was a finalist in the Dutch Design Awards. At night, the Hovenring boasts beautiful lighting that provides cyclists with a sense of safety and security: it is truly befitting of Eindhoven’s status as the City of Light.